* Initial field work for this study took place from fall 1971 through fall 1972, and was sponsored by the Latin American Studies Institute at The University of Texas at Austin. Brief field studies were also conducted from 1974 through 1978. Communications with key informants have been ongoing through the present. t A Mexican municipio is analogous to a county in the US. Fig. 8.1 South Sinaloa, Mexico, with swamp and flood area, and relief greater than 2,000 m above sea level. coastal plain for more than a millennium prior to European colonization (Scott, 1967-1972). Edward Spicer (1969, p. 788), the region's principal ethnohistorian, has said of this coastal region that it provided fish and shellfish in abundance. The lowland was an area with potentialities for large concentrations of population, even without irrigation techniques, potentialities which were beginning to be realized at the time of the entry of the Spaniards. Today, more than 575 large shell accumulations, deriving from the aboriginal population's long-term exploitation of oysters and other marine mollusks, have been found scattered through the region. 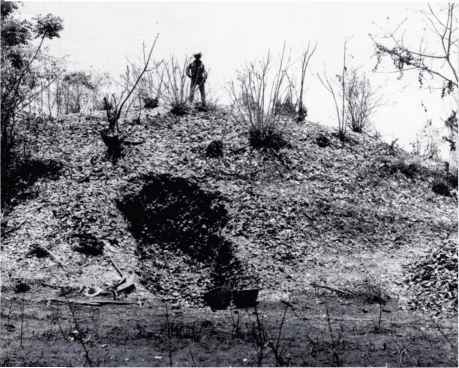 According to Shenkel (1969, p. 25), an archaeologist who studied them for several years, these shell mounds (Fig. 8.2) "range in size from small surface scatters ... to impressive dumps up to two miles [3.22 km] long, 600 feet [183 m] wide with peaks reaching 35 feet [10 m] in height," with some originating as early as ad 300-400 (p. 42). These mounds, as well as the primitive fish hooks, harpoon points, and fish bones which are sometimes found buried within them, provide mute testimony to the aboriginal population's long-term dependence upon mollusks along with other marine species. In the southern part of the region, in the middle of a densely vegetated and nearly impenetrable mangrove swamp, a particularly large and enigmatic shell mound has been found. Measuring approximately 79 by 89 m at its base, and 23 m in height, it is roughly quadrilateral in shape, as were most Mesoamerican pyramids. Archaeologists estimate that it was constructed sometime between AD 700 and 1300, and think it was possibly a ceremonial structure on the order of a temple mound which had been built by people living in a powerful chiefdom or perhaps a nascent state. Particularly interesting is that much of this mound is comprised of the shells of edible mollusks which were never opened. This suggests that the aboriginal people who built it enjoyed such an abundance of these resources that they could waste them as food, utilizing them instead as building materials - perhaps also in a display of conspicuous consumption to flaunt their power to their enemies (Shenkel, 1969, 1971; Snedaker, 1971). 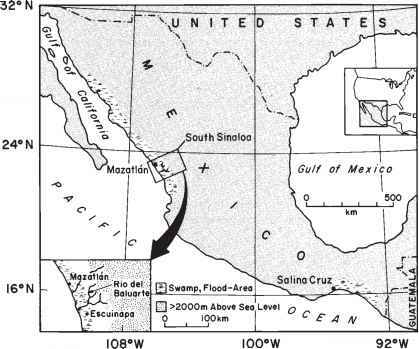 Archaeological studies also indicate that a severe flood occurred sometime between AD 1100 and 1300, decimating South Sinaloa's shellfish populations and forcing the human population to abandon the estuarine region completely (Shenkel, 1969, pp. 43 & 46). What happened to them immediately thereafter is not known. They may have merely resettled further inland, turning their attention to agricultural pursuits, or they may have suffered cultural extinction by being killed off or enslaved by other already well-established and hostile people inhabiting the higher ground along the foothills at the edge of the coastal plain. 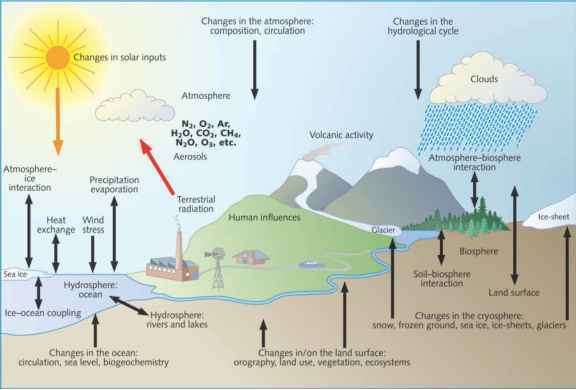 Regardless of whatever actually occurred, the coastal plain was gradually resettled as its marine resources recovered. By the time of the Spanish conquest in the early sixteenth century, it was again densely populated with people who harvested its abundance of marine resources, particularly shellfish. * These mutually antagonistic chiefdoms (which were perhaps nascent states) were referred to by the first Spanish explorers traveling South Sinaloa's coastal plain as senorios, that is, regions under the control of a powerful headman. The part of South Sinaloa under consideration in this study fell within the senorios of Chiametla and Aztatlan. Chiametla, located on the coastal plain along the banks of the Baluarte River, may have politically controlled over 22 smaller, satellite villages. Less is known about Aztatlan, which had its center on the coastal plain along the banks of the Acaponeta River, although it is fairly certain that it similarly held sway over satellite villages in what is now the extreme south of the modern-day state of Sinaloa as well as the northern extreme of the modern-day state of Nayarit. Most likely the aboriginal people the Spanish first encountered along South Sinaloa's coastal plain were members of the highly cultured Tahue and Totorame ethnic groups, both of which spoke a Uto-Aztecan dialect and were part of the Mesoamerican cultural tradition (Spicer, 1969; Segmen, 1972, p. 34). oration at various sites on the fringes of the briny lagoons, and their active trading of smoked oysters and salt with their neighbors. Salt was extremely important to the pre-Columbian people as a preservative of fish, shrimp, and other foodstuffs. The region's conqueror, Nuno Beltran de Guzman, well known among historians for his unusually ruthless and genocidal treatment of the region's Indians, made his first foray into the region in 1530, establishing a camp along the flood plain of the Acaponeta River. He did not remain there for long, however. Soon after his arrival he was abruptly forced to leave, as the sudden onset of a particularly heavy rainy season led to the loss of "a great number of his Indian allies as well as his own men and provisions during the inundating flood of the season" (Segmen, 1972, p. 41). From the Acaponeta River flood plain Guzman and his army then traveled about 60 km further northward, eventually arriving at the head town of a chiefdom or nascent state which the Indians called Chiametla. Realizing this town was a center of some importance, Guzman established a mission fortress there in the heart of the coastal zone, near the present-day town of Rosario, and took over the native people's thriving oyster and salt-producing industries. Widespread decimation of the aboriginal population ensued for the remainder of the sixteenth century, not only because of ongoing warfare between the Indians and the Spanish conquerors, but also because of the diseases the Spaniards introduced for which the native people had no immunity - especially smallpox and typhus. As a result, the region's early colonial era was characterized by slow growth, and life and travel remained extremely precarious for the Spanish colonists for a long period of time. Notably, during the early 1540s warring Indians drove nearly all Spaniards from the region, including from Chiametla, and prevented their re-entry until the early 1560s. However, with the discovery of valuable deposits of gold and silver in the nearby mountains, Spanish colonization and pacification efforts were intensified, increasing the rate of Indian exterminations, as Indians were either killed or enslaved and forced to work in the nearby mines. Chiametla was again briefly reoccupied by the Spaniards in the early 1560s, and their exploitation of the fisheries and salt works resumed there. The region, however, was not easily pacified. Various colonial records describe the region as a sanctuary for rebelling Indians and note that trouble with warring Indians continued well into the 1700s (Segmen, 1972, p. 46). Once the region was finally "pacified" - and indeed nearly depopulated of Indians in the process - new settlers began to move into the area, during the late eighteenth and early nineteenth centuries. They established cattle-raising haciendas and other business enterprises, particularly fisheries. By the mid-nineteenth century various historical documents describe the region as once again having a thriving trade in smoked oysters and salt. This trade reached to such distant urban centers in Mexico as Durango, roughly 160 km to the east, on the other side of the formidable western mountain range, as well as to Guadalajara, about 300 km to the southeast. Then, in the late nineteenth century, the region's oysters and shrimp were discovered by Asian traders. Practically overnight a lively export trade in the region's seafoods developed, which saw South Sinaloa's oysters and salted shrimp being transported to distant markets in China and Japan. Correspondingly, inshore production levels of marine foods soared.